This tutorial goes over creating a new view which will watch the workbench selection and use IAdatable to show how the uDig application functions at runtime. This workbook answers the bigger question of “Where to Start” when making your own application. You will often start by contributing to the user interface - in this case we are defining a new view. This definition consists of both an XML fragment being added to the plugin.xml defining the title, icon etc... and a new class implementing the user interface. In other cases you may be defining a new menu option or a new tool. The second step will be paying attention to the what the user is up to - in this case we locate the SelectionService for the workbench window. 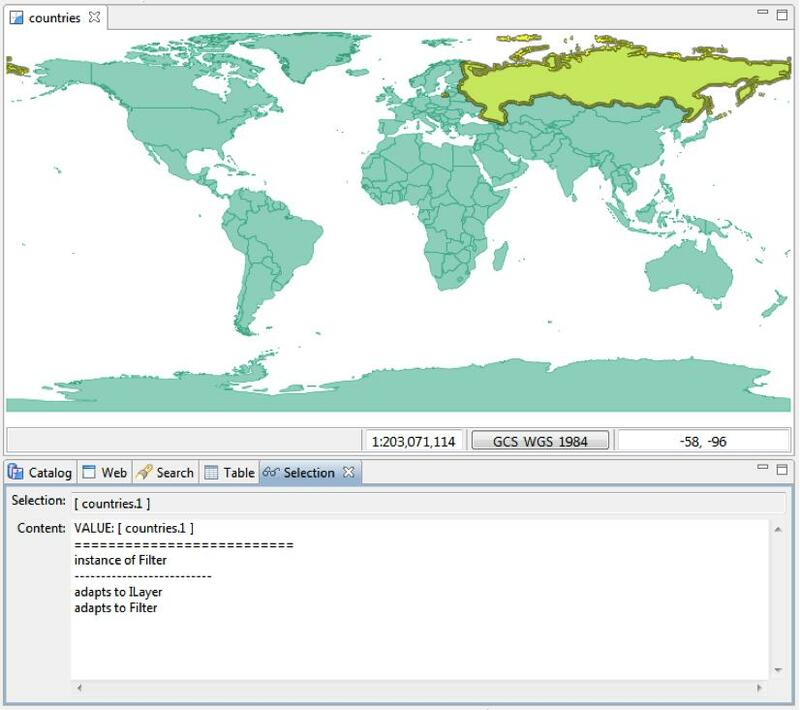 In other cases you may be checking the current Map or the currently selected Layer. Finally we will be acting when the user does something - in this case we are waiting for the user to select something and reporting back on what we find. You should have noticed that each View provides a unique selection. Did you also notice that the Map Editor will change what workbench selection it provides based on the current modal tool. Explore the available tools and note what content each tool thinks it is working on. Currently, if you want to see the workbench view you have to select Window>Show View>Other to open a the Show view dialog. You can then use the Show view dialog to navigate to Other >Select View. Can you use a “perspectiveExtension” make your view show up under the main view menu? Advanced: In this example we have checked “instance of” and “IAdaptable”. Can you extend this example to check IResolve? IResolve is uDig specific and represents external content. You should be very careful to read the javadocs and not call any methods from the event thread that may block while waiting for a WFS service on the other side of the work. If you make a mistake here it will look like the uDig application has “hung”. The uDig API very carefully throws IOExceptions when ever there is a chance of waiting for an external service. If you find yourself doing a try/catch block while in an event thread you have probably made a mistake! Advanced: If you’ve done the IAdaptable workbook, you will note that your SelectionView tells you an IService is selected and gives you its URL. Similarly with an IGeoResource. However, it doesn’t seem to be able to adapt them to URLs...go ahead and fix that. Hint: you’ll need to use the AdapterUtil class. The use of Workbench “Services” is similar to a global scratch pad - this an example of the “blackboard” design pattern. The idea is that workbench services act as a place for plugins to communicate with each other. Specifically for SelectionService it allows the plugins to report on what the user is doing. The upside of this is that the workbench as a whole appears to be an integrated application; when in fact each of the plugins have never been formally introduced. Concept: Workbench selection is used to communicate between plugins. The next idea presented here is that of an “extensible interface”. We are used to as Java developers the idea of a class implementing an interface. The extensible interface idea allows programers to “extend” the number of interfaces an object can be converted to at runtime. If you like you can extend PlatformObject as a quick way to implement IAdaptable. 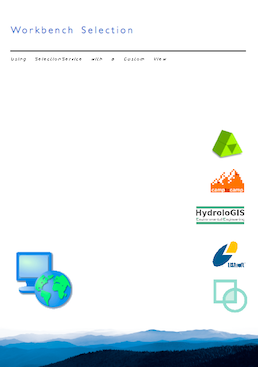 As an example you can select a Shapefile in the udig catalog and resolve it to a org.geotools.data.DataStore. This may throw an IOException if the user does not have read permission for the file. Concept: A single selection can “Adapt to” multiple Java Interfaces as needed.